Raman spectroscopy has been found to be a reliable and non-destructive method for rapid discrimination of different plant species or chemotypes if characteristic key bands can be observed in the spectrum. Today, even portable Raman spectrometers are available which only need sample amounts of a few microliters or milligrams. In most cases, measurements can be performed directly on plant tissues as well as on fractions isolated from the plant material by hydro-distillation or solvent extraction. Generally, Raman spectroscopy allows obtaining spectra which may present several characteristic key bands of individual plant components. Very often these bands provide very useful information about the chemical composition, including both primary and secondary metabolites occurring in the investigated samples. Based on such markers, spectroscopic analyses in principle allow to discriminate different species, and even to classify chemotypes among the same species. The ability to rapidly monitor various plant components makes it possible to efficiently select high-quality single plants from wild populations as well as progenies of crossing experiments. Furthermore, Raman spectroscopy can also be used by the processing industry in order to perform fast quality checks of incoming raw materials as well as continuous controlling of various production processes. 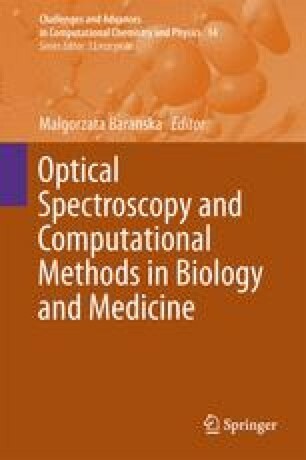 Beside MS and NMR measurements, Raman spectroscopy represents a very important analytical tool in the field of plant metabolic fingerprinting providing an unbiased, global screening approach to classify samples that change in response to the genetic background, various plant diseases or influences by the environment (e.g. various stress effects).